Changing up Christmas, one degree at a time. Christmas is one of our favorite times of the year and there are many ways to make it more enjoyable, manageable and more conveniently sustainable. Madeleine Murray and Tara Shine from Change by Degrees offer a few simple tips on how we can do things differently this year. Hopefully, one or two ideas might be incorporated into your Christmas celebrations. Santa doesn’t wrap presents! He is too busy (as are the elves) and he doesn’t want to create unnecessary waste. All that paper and ribbon and selotape! Kids understand that he doesn’t have the time and they like being able to see who owns what when they tear into the room (at whatever ungodly hour it is!). Plus, so many other gifts kids receive are wrapped so they still get to rip things open. The really shiny wrapping paper (or ribbons or gift ‘bling’) isn’t recyclable so try to stick to pure paper for wrapping gifts. Remove the big bits of selotape before you recycle the paper – small pieces are okay apparently, (we have checked!). Get your leftovers game on! Plan out a dinner a day and think about what was cooked the evening before. Roast potatoes can be fried up with onions for breakfast; use pastry to turn excess cuts of meat into some class of a pie; that mountain of cheese you bought? Melt it with wine, garlic and some flour and you’ve got a fondue for all the excess veggies in your fridge. Blitz up all that fruit before it turns and give everyone a badly needed health-kick smoothie on St Stephens Day. We always have too much cream in the fridge – make Mary Berry’s ice cream. It’s idiot proof and divine. This list is endless. Quality experiences are better than massive extravagances! My eleven year old was totally at a loss as to what to ask for from us. When I suggested he might like a trip he mentioned Disney Land! I brought him back to reality and then suggested a day out in Cork with a trip to Life Style Sports, a burger and the cinema. All on his own, with just me, his mum. A day in the city isn’t edge-of-your-seat stuff - it’s the ‘all on your own’ part that matters most. We normally move in a pack given the sheer size of our family (4 kids!) so this is a genuine treat for him and the idea literally lit his gorgeous face up. Don’t underestimate the value of even the simplest experiences. 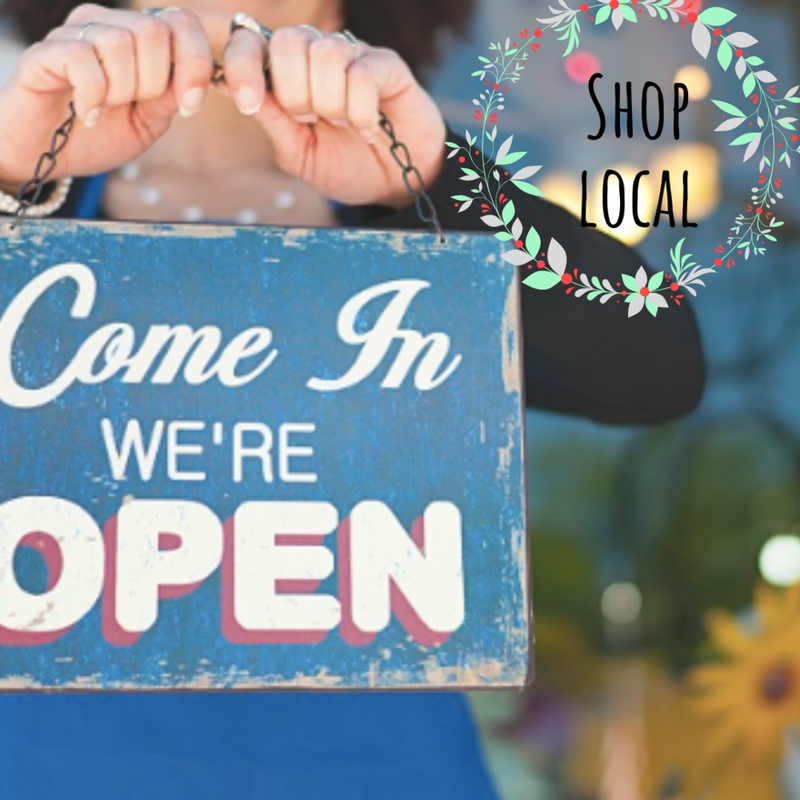 Shop local! I pick up a lot of gifts locally because I’m time poor and disorganized! Now more than ever, being time poor and disorganized has its up side – namely, it means I spend money in local businesses, which means they also, have a lovely Christmas. Research has shown that the Irish like to shop online. What’s more, they tend to buy from foreign brands over Irish ones – that equated to a spend of over €2.7billion on foreign brands in 2017. Supporting Irish businesses, whether online or on the street, helps a community thrive. Try to avoid bulk buying in the big chains when that spend counts for so much more amongst the smaller Irish businesses in your community. Buy a live Christmas tree in a pot. Three years ago I bought a living Christmas tree, in a pot, for the same price as a cut tree, and it’s still perfect. We leave it outside and drag it in each Christmas. It means we're not buying freshly cut trees year on year and that makes us feel really good. In Ireland, 600,000 Christmas trees are harvested each year. Interestingly, the main contributor to the environmental impact of your tree is from transport. The further the tree travels or your drive to collect it, the bigger the carbon footprint. After Christmas try and get your tree to a local tree recycling point (some councils even offer a pick up service), so that it can be turned into mulch for gardens. Try and avoid your tree going to landfill where it slowly decomposes giving off methane gas, a potent contributor to climate change. An artificial tree is an option if your store it well and use it over and over – but buying a cheap one and throwing it out after a year is not a good idea. The Christmas tree industry is a big contributor to the Irish economy, especially in rural areas – so try and get yourself a live tree and enjoy it for years! It will save you money, you get the real pine smell and reduce the amount of plastic paraphernalia in your house at Christmas. Buy a local free-range turkey. I make a point of buying the very best, local free-range turkey I can get my hands on. There’s so much choice out there and supermarkets can make some prices very attractive but, doing a bit of groundwork and sourcing a bird that comes from a trustworthy supplier and has lived a good life makes all the difference. Plus, it always tastes amazing! And use every bit of it, for pies, curry, sandwiches and stock. Buy good quality items rather than tons of stuff!I try not to over buy when it comes to presents. Buying one good quality item instead of piles of stuff (aka tat), even when it comes to stocking fillers, just makes so much sense to me. And people appreciate it much more when they get a gift that lasts and they know you have put some thought into it. So make a list, stop and think and avoid panic shopping. Also bring some bags when you go to town and avoid the glut of paper bags you end up with after a day’s shopping – there are only so many you can reuse. Reduce your food waste! Our family often travel up to Northern Ireland over the holidays so we have to be really mindful of not buying too much food – it’s too long a drive to bring a car full of left overs. Besides, the shops are only closed for a couple of days and if you are going to be out visiting family or friends or travelling during the holidays build that into your plan and avoid the need to throw good food out. I do my best to shop just for the days we're at home and if you have more than you need freeze it, give it to a neighbour or re-gift it - no one (with any sense!) will refuse your lovely food. Fact. Try to buy from businesses that recycle properly. A survey found that over a quarter of people (26%) purchase half of gifts online and half in store and just under three quarters (74%) would be more likely to shop online if they knew that the business they were buying from recycled correctly. This result is of relevance when considering a recent report by Repak that found that many popular online retailers currently do not contribute towards the cost of packaging waste collection created. Obviously, none of this is rocket science but avoiding waste and unnecessary consumption (i.e. buying stuff) makes a big difference. It’s reported that the average household produces 20% more waste over Christmas. It is lovely to give and receive presents and to cook and eat good food – but an emphasis on the quality and not the quantity feels good. And that applies to quality time with our loved ones too. Happy Christmas folks and here’s to an exciting and more sustainable 2019.